Amid a rising tide of trade protectionism, Korean carmakers are facing a dilemma between producing abroad or at home, where labor agreements force them to maintain staffing levels at high wages. Producing a vehicle in South Korea using highly paid workers costs a lot more than in emerging markets with cheaper labor such as in China, Southeast Asian countries and even Eastern Europe. The low profitability of vehicles made in Korea due to high tariffs has been also cited as a hurdle for Korean automakers. But according to industry officials, Hyundai and Kia, the two largest carmakers have no choice but to keep their local production levels the same due to the collective agreement it signed with unionized workers, and faces political and social pressure to keep its suppliers afloat. Of the 7.4 million vehicles by Hyundai and Kia sold worldwide, 43 percent were manufactured in South Korea. The figure includes vehicles exported overseas. Under the labor-management agreement, Hyundai has to produce at least 1.6 million units a year at its local manufacturing plants and has to seek local workers’ “agreement” when planning to build an overseas plant. The agreement also states that the company cannot lay off its workforces citing a slump in business, or declining market demand. If market forces require plant closures or reductions in production, the agreement states that the company has to do this overseas first. “Even though Hyundai and Kia face growing need to expand its overseas production, they can’t do so because of the pro-labor agreement they signed with the unionized workers. But there’s a possibility of change in the next 5-6 years when a majority of union heads retire,” said Lee Ho-geun, professor at Daeduk University. By 2025, around 17,500 unionized workers are expected to retire from Hyundai Motor. The union has demanded to hire around 10,000 new workers at that time. Management has refused. The declining number of workers at plants in South Korea and anticipated new labor-management agreements have raised the possibility of the carmaker gradually leaving its home ground and expanding its overseas production in emerging markets of India, Latin America and Southeast Asia. And an official at Kia said the union has been sensitively reacting to overseas production plans. Last week, the labor union at Kia demanded the company suspend the production of Telluride SUVs at its US plant in Georgia, and the planned production of the SP2 in India. They said they need to secure their jobs because of declining orders from the local market. Kia said the case has already been discussed and there’s nothing more to talk about. “They seem to be concerned about their job security after watching recent cases of other global carmakers carrying out massive layoff and relocation plans,“ he said. Adding to the automakers’ dilemma is the incumbent administration’s pro-labor outlook, which makes it difficult to even talk about relocating or increasing labor flexibility for at least a couple of years. But experts said carmakers reducing their production capability at home would happen one way or the other, to maximize profits and to make their businesses in respective markets more accessible. “I think Korean carmakers making investments on overseas plants will be an inevitable choice in the future, not only as a way of avoiding high tariffs and other forms of regulations on foreign cars, but also due to the stagnant market demand at home. The Korean auto market is saturated,” said an industry insider who declined to be named. Lee of Daeduk University say that it was possible that GM or Renault Samsung to withdraw their manufacturing bases while leaving their more competitive and cost-efficient R&D units here. Korean carmakers’ mooted departure has instigated strong resistance from their suppliers, unions, and the communities they belong to, as well as local politicians. Suppliers say their business survival is at risk, since many have been dependent on a single specific carmaker, such as Hyundai or Kia, for a long time. Adding to the complex task carmakers face is the recent paradigm shift to zero-emission cars. Since electric cars require a lot fewer components than cars powered by combustion engines, thousands of workers are expected to lose their jobs. And because the switch away from fossil fuels is inevitable, both the carmakers and suppliers are pressed to come up with alternative plans. 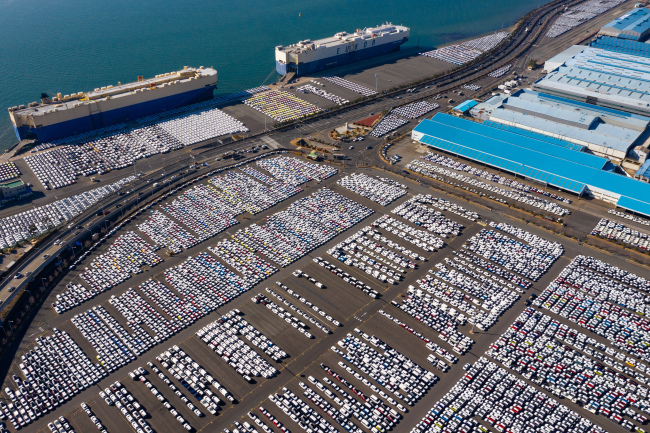 “Carmakers should pursue a win-win strategy with suppliers and help them become competitive on global standards and diversify their supply chains even to those overseas,“ said Moon Byung-ki, senior researcher at Korea International Trade Association. But what’s missing here is the government’s role in setting a clear direction. Experts say the government should be more specific about their choice of the future of green cars.